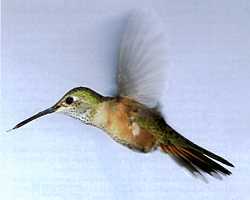 The male Broad-tailed's wings make a cricket-like whistle in flight. One female Broad-tailed holds the North American age record, at twelve years old. Average weight: male 3.16 g, female 3.6 g. Females are larger than males. Adult male: Metallic green back and crown, white breast, rose gorget, rounded tail. Adult female: Green back and crown, white throat and breast with black spots, rusty sides, green central tail feathers; outer tail feathers are rusty at base, black in middle, and white at tips. Observed in Alabama, Arizona, Arkansas, California, Colorado, Georgia, Idaho, Kansas, Louisiana, Mississippi, Missouri, Montana, Nebraska, Nevada, New Jersey, New Mexico, Oregon, South Dakota, Texas, Utah, Wyoming, and Manitoba. Winters in Mexico. 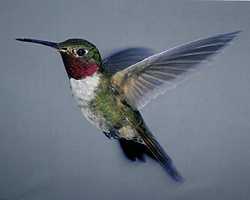 For maps showing population distribution and trends, see the National Biological Service's North American Breeding Bird Survey species account.